The DPTechnics DPT-Module-v1 is a compact System-on-Module which is perfect to create smart IoT products. The base of the system is the ever so popular and robust Atheros Qualcomm AR9331 System-on-Chip and 64MiB DDR2 Hynix RAM memory. 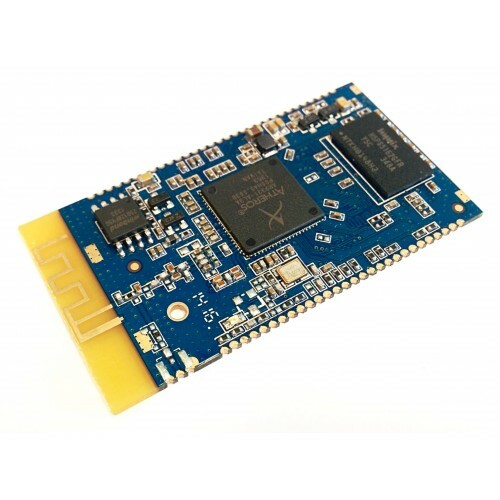 Together with 16MiB of Winbond flash storage this small (27.5mm x 52mm) Linux computer can run any IoT application it is presented with. The module comes with the open source DPT-Board OS pre-installed, but you can off course have your own software stack installed in it right from the factory. The module has a built in WiFi transceiver and antenna which is factory calibrated and tuned. This ensures the same reliable WiFi connectivity every single time. The DPT-Board OS is based on OpenWRT Linux and available on our github page. There is no need to acquire any expensive toolchain to develop software for the DPT-Module v1. We can even provide you with a virtual Ubuntu machine wich contains the complete development environment pre-installed. The module is designed around the Atheros Qualcomm AR9331 System-on-Chip. This SoC was especially designed for 24/7 operation and secure networking applications. By using the DPT-Module you can rest asured your device will have the robustness needed for your application. The DPT-Module V1 has both CE and FCC certification for both home and industrial use. As the module contains all high speed circuitry this makes it a lot easier to design your next smart IoT product. On top of that our engineers can review your design to help you pass your CE and FCC tests as fast as possible. Power usage becomes ever so imporant. The DPT-Module integrates many peripherals on the same module which keeps power usage and heat development extremely low. Typically the module consumes about 0.3 Watts of power when the WiFi connection is associated with an accesspoint. We can deliver the DPT-Modules in plastic trays ready for the pick-and-place machine. It's also no problem to make the module pass the reflow oven again. This means the production costs for boards using the DPT-Module remain low and the quality is consistent. The Linux distribution which is installed on the DPT-Module leaves more than 10MiB flash to be used by the end user application. When booted only 30MiB of RAM memory is used, so the smart applications which run on the board have access to more than 34MiB of RAM memory.